It feels like yesterday when I began my journey of a thousand miles. Step by step, I’m finally here, but the journey is still going. Looking back, I see years and days invested. I see days invested in personal development and community development endeavors, such as community service and charity works. I was first introduced to the idea of giving back to my community in 2013 when I was in Grade 8 after joining Kucetekela Foundation. As a young boy without exposure, I did not like the activity at all. This is because after coming back home from a boarding school, during the holidays, I felt like I was being deprived of the little precious time I had to spend with my family and friends at home. However, with time, as I began to see the impact I was making in my community and the benefits I was receiving from the activity, such as learning new skills and how to interact with people from different walks of life, my interest began to expand. Soon, it became one of my favorite activities, as it is even to date. My first community service activity was done at Ng’ombe Community Clinic, the only health facility in Ng’ombe Compound. Here, I worked at the reception department where I was responsible for receiving and registering patients. I also worked in the pharmacy department and the storage room. At the pharmacy department, I was assisting the pharmacists by breaking the bulk of medicines and packing them into smaller sachets, making them ready to be handed to patients through the window. At the storage room, I was filing patients’ documents. The work was not very easy, but with perseverance and doing the job from a point of knowing that I was making a difference, I managed to cope with it. After staying for a year without doing any community service activity due to my Grade 9 National Examinations, I resumed in 2015 when I was in Grade 10. 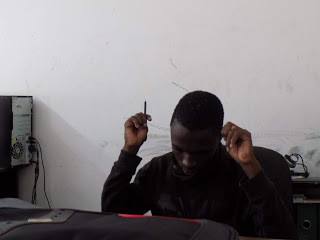 This time around, I did not only work at Ng’ombe Clinic but at a larger institution called Centre for Infectious Disease Research in Zambia (CIDRZ) where I also did my work experience from as a health worker. At CIDRZ, I was mainly helping the nurses, laboratory personnel, and psychosocial counsellors with their various duties. I took patients’ vitals, such as blood pressure, temperature, height and weight. I was also filing documents as well as helping the laboratory personnel in carrying out blood tests, such as malaria and HIV/AIDS tests. At both institutions, I could see that with my assistance, patients were being attended to on time, hence the problem of long queues was minimized. When I was in Grade 9, I, together with two other KF students, Lydia and Peter, decided to run our own community service project called The Voice of Impact. Our aim was to reduce the number of young people in Ng’ombe Compound who were indulging themselves in drug and alcohol abuse. We were also seeking to prevent young people from dropping out of school by keeping them busy with academic work and talent building during their termly holidays. In this regard, we tutored them in key academic subjects, such as mathematics and English and trained them in selected arts such as drama, poetry and singing. The students we recruited were fifty from three government schools in Ng’ombe. As a movement, we managed to record a 97% pass rate for those who were in exam classes (Grades 7 and 9). Those who made it proceeded to pursue their educations and building their talents further. Each time I meet some of these students, I am always excited knowing that I played a role in helping them become great in life. Owing to this great impact I was making, community service became so very interesting that I was not only doing it during the holidays, but also during the days I was in school. At school, I joined a community service and environmental conservation club. As a committed and dedicated member, I took part in a tree-planting movement in which we planted many trees within the school grounds and outside the school in the surrounding communities. As time went by, one of the leaders decided to break away from the club and start her own club, taking the route of community outreach. She called her new club “Leaders of Tomorrow.” This club grew and became prominent. Upon seeing the impact, I decided to also join when I was in Grade 11. Soon, I was voted for as the new president of the club. As the club’s new leader, I decided to expand it by broadening the outreach base. During my time, it became known as a community service and charity club. 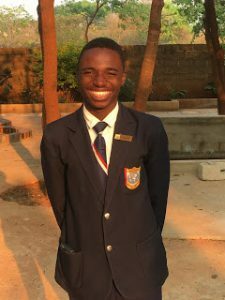 Taking advantage of my other leadership position as Head Boy, I organized fundraising ventures and outreaches to orphanages in collaboration with the school. At these orphanages, we made donations of assorted goods such as groceries, food and clothes. We also took time to visit the orphanage twice every week in which we played with the kids at the orphanages. In addition, as a way of fundraising and discouraging littering, I launched a recycling project in which we went around picking empty plastic bottles in the school’s surrounding communities to sell to the recycling companies. As we were picking the bottles, we also took time to talk to few people who shoed interest in what we were doing about the effects of littering on the environment and why everybody should be involved. Within a short period of time, what we achieved as the club was amazing. In all we did, we strived to put a smile on an unhappy face, which we succeeded. We also succeeded in inculcating the value of a litter-free environment within the school and surrounding communities. After completing high school in 2017, I was freer to carry out a lot of activities in the areas of my interests. I was able to give back to my community in volunteering, charity works, community service related activities, religious activities and entrepreneurial ventures. Three weeks after graduating from high school, I was privileged to be offered a job as an intern at one of the largest book stores in Zambia called BookWorld. This was a great opportunity for me as I had always wanted to work in a business environment. In the company, I was fortunate to work at the largest and busiest branch of the twelve branches, which was located in the oldest and largest shopping mall in the country called Manda Hill. My job as an intern was to ensure that sales were kept high through various selling techniques. I was also offering assistance to customers where necessary and I ensured that books were well organized and packed in the shop. My experience at BookWorld was great, because it made me grow into someone better. I have become more patient and understanding especially when dealing with people from all walks of life. I was exposed to the world of business in which I discovered that I can do well in business marketing. After my three months contract with BookWorld was finished, I went to do a voluntary internship with USAP, a university access program for high achieving students from low-income backgrounds for two months. As an intern, my job was scanning the USAP 2018 applications and filing receipts for accounting purposes. I also attended recruitment meetings at schools with the country director. Seeing that I was a student under the organisation from the previous year, 2017, I was also a student representative on the USAP admission committee. Working for USAP gave me a chance to know what happens behind the scenes of a successful organisation. I got to experience what admission officers experience at academic institutions such as making tough decisions during the selection process. Furthermore, I was made to understand what admissions officers usually look for in students. Being passionate about knowing God more, I decided to do a Bible School Course called Basic Certificate Course. The course was quite intense, as I had to travel to and from school daily for two weeks and spent the whole day learning until we finished all twelve courses. We were intended to be finished in six months. The class was comprised of eighty students and I was the youngest both in age and experience. At the end of the course, I graduated as the best student with a distinction. Upon completing Bible school, I volunteered to work for God at church. I was given a fellowship to run as an assistant call minister. Since then, I have been engaging in Evangelism and secretarial works at my local church congregation. While doing many activities, I have been running two business initiatives. One is a business of selling building sand in my local community, while the other is offering tutoring services to those who are writing their Grade 12 and 9 exams this year. Through these small ventures, I have been earning a bit of money to help supplement some family needs. Finally, a description of my Gap Year experience would be incomplete without mentioning the process of applying to universities. I applied to many colleges abroad, mostly in the U.S., through USAP and KF. However, many of these colleges could not offer me admissions. Not being admitted did not stop me from continuing to apply to as many as were available. Finally, I was admitted to African Leadership University (ALU), the Harvard of Africa, after winning a Nelson Mandela Centennial Scholarship. This is a university I strongly feel is a best.